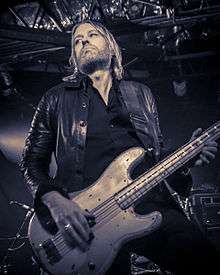 Chris Wyse (born July 15, 1969) is an American bassist and vocalist, known for his performances with Ace Frehley, The Cult, Ozzy Osbourne, Mick Jagger, Tal Bachman and Jerry Cantrell, among others. Wyse has played with The Cult from 2006 to 2015, and is the vocalist and bassist for Owl, a band he founded in 2007. Owl, who have been described as "approaching timeless rock structures through a healthy amount of experimentation and instrumental intricacy"  released their debut in 2009, followed by the album The Right Thing in April 2013. The first music video from the album, the title track's The Right Thing, premiered on Rolling Stone's website in March 2013. Owl will release their third album, Things You Can't See, in the summer of 2015. Wyse is a first-generation Irish American, and was born in Queens, New York. He discovered the music of Kiss, The Doors, and Led Zeppelin in grade school, and was inspired by Iron Maiden's Steve Harris to play bass. Performing with local bands in New York, Wyse's ability and innovative approach to the bass was quickly acknowledged, and at 17, he was profiled in Guitar Player Magazine. At 20, he was featured in Guitar For the Practicing Musician. In 1990, prompted by the success of a studio session with musicians associated with Steve Vai, Wyse moved to Los Angeles, where he devoted most of his time to playing with bands. After performing with artists including Guns N' Roses's Chris Pitman and Tool’s Paul D'Amour, Wyse was introduced to acclaimed producer Bob Rock, and became Rock's 'go-to' bassist, playing with Rock-produced artists including Tal Bachman, as well as continuing to play with other artists, including Scott Weiland. In 2001, Wyse played on the Cult's well-received album, Beyond Good and Evil, which Rock produced. In 2006, he became the Cult's full-time bass player, touring worldwide and recording two additional albums. In 2004, Wyse was recruited for Ozzy Osbourne's band by drummer Mike Bordin. He played on Ozzy's Under Cover album, which was included in Osbourne's box set, Prince of Darkness. Additionally, Wyse performed and recorded with Bob Rock's band, the Payola$. In 2003, Bob Rock, who was then producing Metallica, urged Wyse to audition for the band. He was one of a handful of bassists selected to play with Metallica during the audition process, which was documented in the film Some Kind of Monster. In 2007, Wyse founded the current incarnation of Owl, an alternative rock band. In Owl, Wyse acts as singer, songwriter, and producer, in addition to playing bass guitar and upright bass, sometimes creating Hendrix-like effects on the upright bass by using a bow. Wyse formed Owl with his childhood friend, drummer Dan Dinsmore, and LA-based guitarist Jason Achilles Mezilis. Wyse worked the on the third Owl record, Things You Can't See, in 2014. In addition, he played bass guitar on Ace Frehley's album, Space Invader  He toured with Frehley following the release of Space Invader. Things You Can't See was released in 2015. as was Frehley's Origins Vol 1. Wyse played bass on the record, which featured Paul Stanley on vocals for the track Fire and Water. Wyse left the Cult in 2015, and has continued to tour and record with Frehley. In 2016, Frehley's Origins Vol. 1 was released. Wyse played bass on the record, which featured Paul Stanley on vocals for the track Fire and Water. ↑ "Chris Wyse at All Music". Retrieved 6 March 2013. ↑ "The Goddess In The Doorway". Retrieved 6 March 2013. ↑ Wang, K.S. "The Cult Bassist Celebrity Drive". Motor Trend. Retrieved 6 March 2013. ↑ Armador, Valery. "Owl Releases The Right Thing". Bass Player Magazine. Retrieved 6 March 2013. ↑ "Owl Examines Consequences In The Right Thing". Rolling Stone. Retrieved 6 March 2013. ↑ "CHRIS WYSE ON TOURING WITH ACE FREHLEY AND OWL'S THINGS YOU CAN'T SEE". Amps and Greenscreens. November 28, 2014. Retrieved 28 May 2015. ↑ "Chris Wyse at LastFM". LastFM. Retrieved 6 March 2013. ↑ "5 Questions With Chris Wyse". The Viper Room. Retrieved 6 March 2013. ↑ "Bob Rock at All Music". All Music. Retrieved 6 March 2013. ↑ "Profile: Chris Wyse". Ampeg. Retrieved 6 March 2013. ↑ "Beyond Good And Evil". MetaCritic. Retrieved 6 March 2013. ↑ "Ozzy Osbourne". Encyclopaedia Metallum. Retrieved 6 March 2013. ↑ "Some Kind Of Monster at IMDB". IMDB. Retrieved 6 March 2013. ↑ Sciaretto, Amy. "The Cult's Chris Wyse Steps Out With Owl". Noise Creep. Retrieved 6 March 2013. ↑ Newsome, Jonathan. "The Right Thing". March 1, 2013. Unsung Melody. Retrieved 11 March 2013. ↑ "Chris Wyse At D'Addario Strings". D'Addario. Retrieved 6 March 2013. ↑ Hodgson, Peter. "Ace Frehley Working on New Album". July 22, 2013. Gibson. Retrieved 28 May 2014. 1 2 BP Staff (February 16, 2016). "Ace Frehley Enlists Bassist Chris Wyse and All Star Lineup For Covers LP". Bass Player. Retrieved 2 May 2016. ↑ Frazer, Bear (December 6, 2014). "Chris Wyse Rocks With Ace Frehley, Preps New Owl EP". Arena. Arena. Retrieved 1 June 2015.